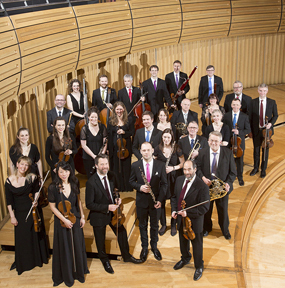 Royal Northern Sinfonia, Orchestra of Sage Gateshead, is the UK’s only full-time chamber orchestra. Founded in 1958, RNS has built a reputation for the North East through the quality of its music-making and the immediacy of the connections the musicians make with audiences. The orchestra regularly flies the flag for the region at the BBC Proms, Edinburgh Festival and further afield, last year touring to Brazil and in Europe. In recent seasons RNS has worked with conductors and soloists Christian Tetzlaff, Christian Lindberg, Olli Mustonen, Paul McCreesh, Robert Levin; a host of world-class singers including Sally Matthews, Karen Cargill and Elizabeth Watts, and also collaborated with leading popular voices such as Sting, Ben Folds and John Grant. It has commissioned new music, recently by Benedict Mason, David Lang, John Casken and Kathryn Tickell, and in the 2015/16 season launched a new Young Composers Competition. RNS has always been actively involved in local communities and in education. This season the orchestra will perform across the region in Kendal, Middlesbrough, Carlisle, Berwick, Barnard Castle and Sunderland, as well as in Gateshead. Musicians support young people learning musical instruments through Sage Gateshead’s Centre for Advanced Training and through In Harmony, a long-term programme in Hawthorn Primary School in which every child in the school learns a musical instrument and plays in an orchestra.